Coming from I-10 take Exit 12, I-110 south. Within 10 minutes, look for the beach exit. Follow the signs to the Pensacola Bay Bridge. In Gulf Breeze, head for the art deco sign of a sailfish that points to Pensacola Beach. DO NOT cross the Pensacola Beach Bridge. 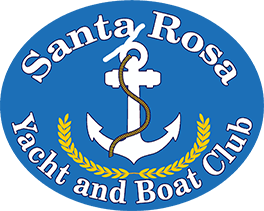 As you come up to the bridge you will see on your left a large White and blue metal building with our name “Santa Rosa Yacht & Boat Club”. You’re here!! Approaching by water from the west (Mobile, Gulf Shores, etc.) transit the Pensacola Land Cut and pass the Pensacola Naval Air Station. Continue east in the Gulf Intracoastal Waterway, across the southern end of Pensacola Bay. 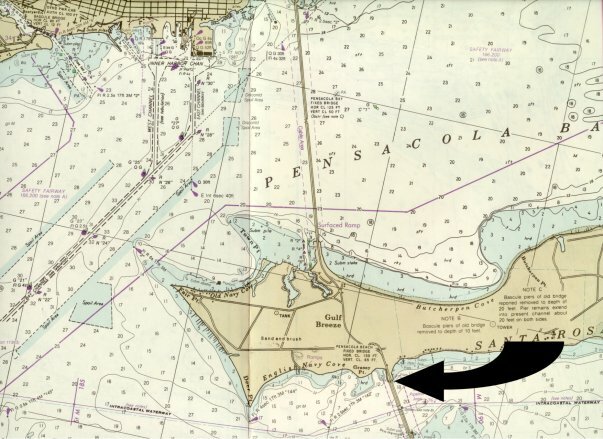 Be alert for the Deer Point Light (Red ICW day beacon #144), there is a bad shoal north of that light and lots of folks get in trouble there. Continue past Red day beacon #142 and go under the Pensacola Beach Bridge. Just as you pass under the bridge look north and you’ll see the jetties for our marina. Approaching by water from the east (Ft. Walton, Destin, etc.) Green ICW day beacon #133 will be on your portside, look north for the marina. Depths approaching the marina are no less than 6 1/2 feet at mean low tide. A steel seawall on the east side of the marina harbor marks the approach, with the harbor entrance at the north end of the seawall towards shore. Stay outside the green buoy, turn to port and our marina will be on your bow. DO NOT attempt to pass north of the entrance marker buoy (white with twin red horizontal stripes with a flashing red light at night). The buoy marks shoal water. *Chart is intended for informational purposes only NOT FOR NAVIGATION. Dry Slip "Launch My Boat"
2018 Santa Rosa Yacht and Boat Club.